Using a charcoal chimney starter is one of the best decisions you can make for lighting charcoal quickly and easily. The biggest advantage is not having to use any lighter fluid. That's right, no more buying those flammable bottles of liquid to squirt over your charcoal briquettes before lighting them. The second big advantage???? Even though you are not dousing them with lighter fluid any more, lighting charcoal with a charcoal chimney starter is incredibly faster and your charcoal will be ready to use in half the time. Do You Make One Or Do You Buy One? Now that you will be lighting charcoal with a charcoal chimney, you need to decide whether you will buy one or make one. A homemade charcoal chimney starter is incredibly easy to make. Simply take a large size coffee can and open it up on both ends and you are done. 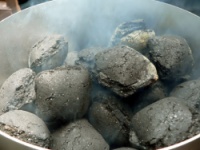 For a little more information on this, go to Homemade charcoal starters, but really, that is all there is to it! The advantages are that this will be a piece of really cheap camping equipment, and if it gets left out in the rain, rusted, or broken, you won't care and will just make another one. I really can't think of any disadvantages of using one...other than it is not as pretty as the commercial charcoal starters. 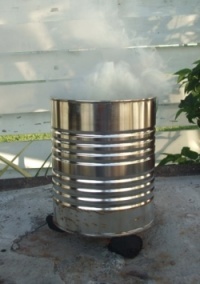 The biggest difference between a commercially-made charcoal starter chimney and a homemade one is essentially the handle. The store-bought charcoal starter chimney usually has some type of a formed handle, wood or metal...insulated, to be able to pick up and turn the hot chimney over and dump out the coals into the bottom of the grill. They also have some sort of ventilation system (holes or wire grates) built in towards the bottom. The grate is placed within the cylinder so the air will circulate and the coals will start easily. One of the disadvantages of this system, however, is that you will have to pick up the chimney and turn it over to dump out the hot briquettes. Out of the commercially-made charcoal briquette starters, we are most familiar with the Weber Rapidfire Chimney Starter. The most popular model around, it holds a large quantity of briquettes and gets your charcoal going quickly. This charcoal chimney runs about $15 and is very easy to use. Another popular model is the Camp Chef Charcoal Chimney. The way to use both the commercial and homemade chimneys is the same. Simply put a couple of sheets of newspaper crumbled up in the bottom, put the charcoal on the top, and light it from the bottom. That is it.